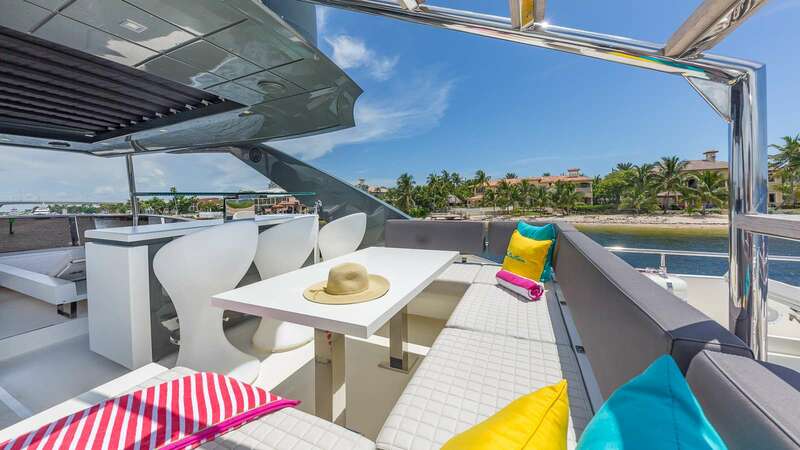 24.8m/81ft open yacht SEADUCTION (ex.ASTONISH) from Astondoa is beautifully designed inside and out with contemporary styling, plush cabins and a range of outdoor relaxation options. 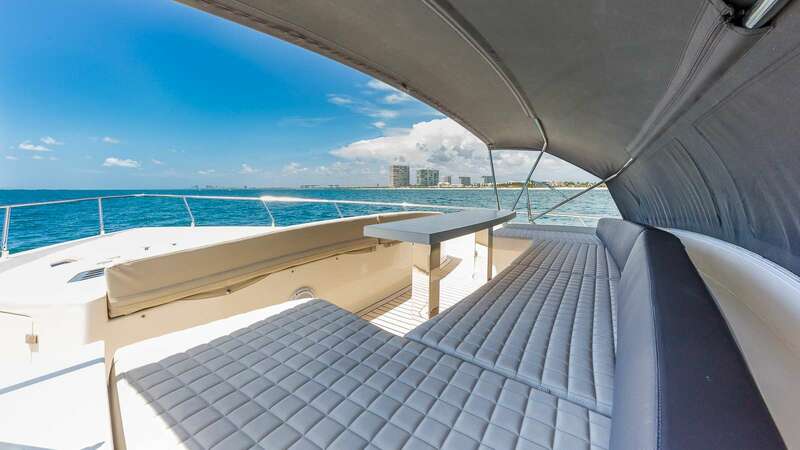 Launched in 2006, she is constructed with a GRP hull and superstructure for a light draft to access shallow bays and coves. 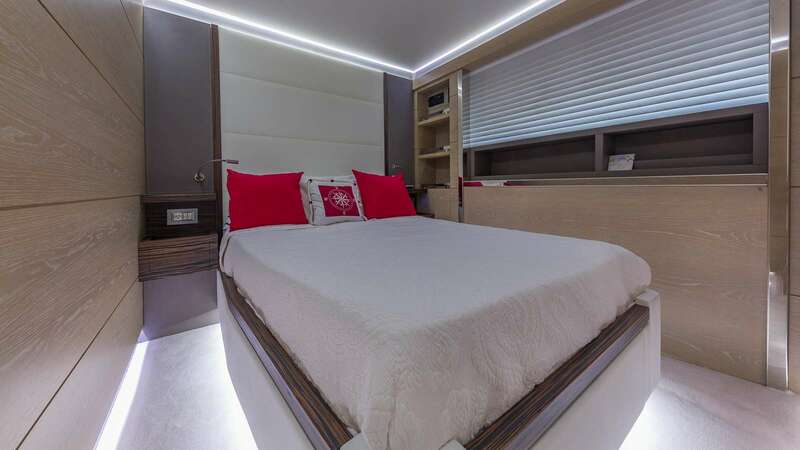 Her on board accommodation sleeps up to eight guests over four pristine cabins, while a crew of three will ensure that every journey aboard M/Y SEADUCTION is carefree. 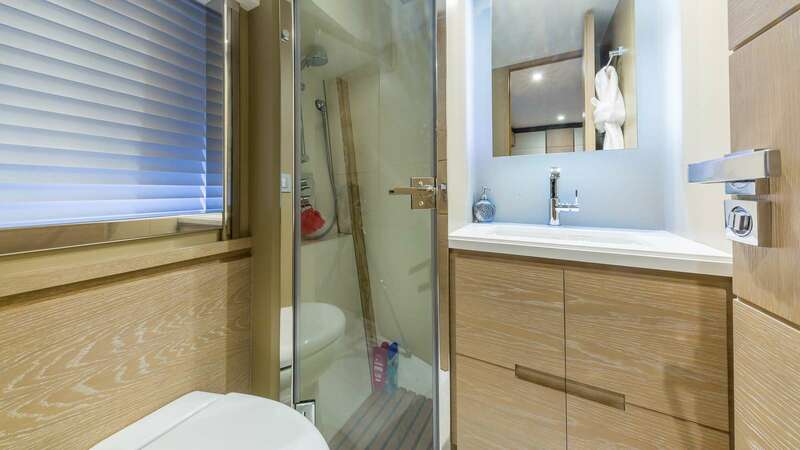 The deep lower swim platform can be used as a sunbathing area close to the sea, and while in transit the tender can be stored here. 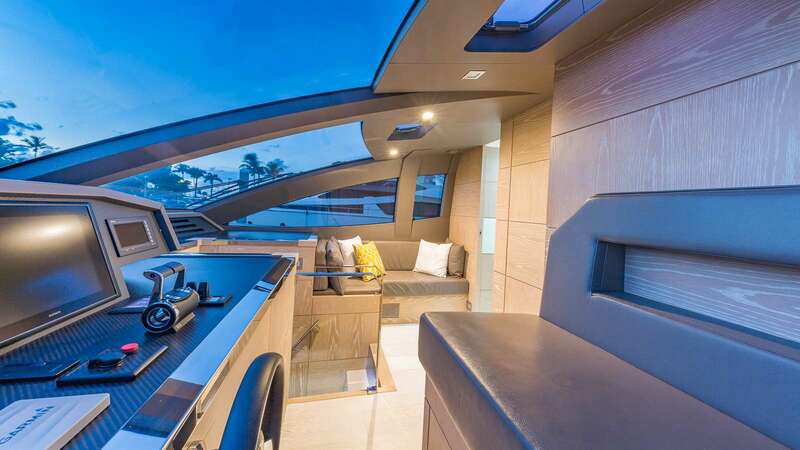 A stairway to port and starboard leads up to the main deck aft, where a sofa follows the curve of the stern and a raised table with additional seating for comfortable alfresco dining. 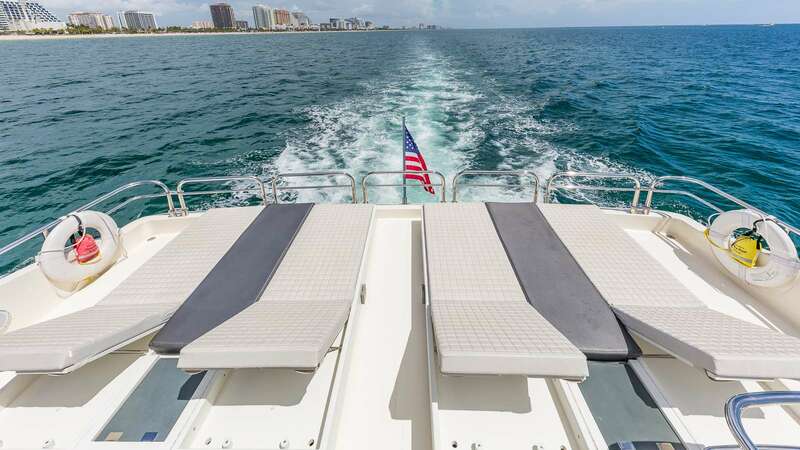 The foredeck is fitted with a C-shaped sofa with a retractable bimini shade, and the elevated table can be used for casual dining and drinks while enjoying uninterrupted views of the surroundings. 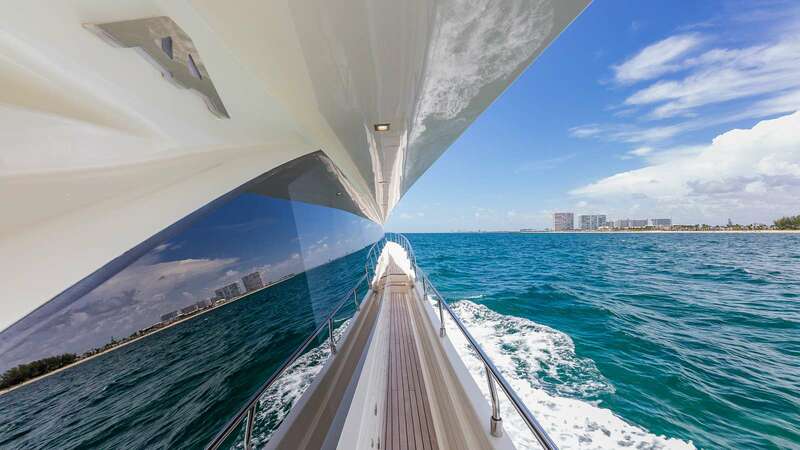 Farther forward, a broad sunpad covers the bow. 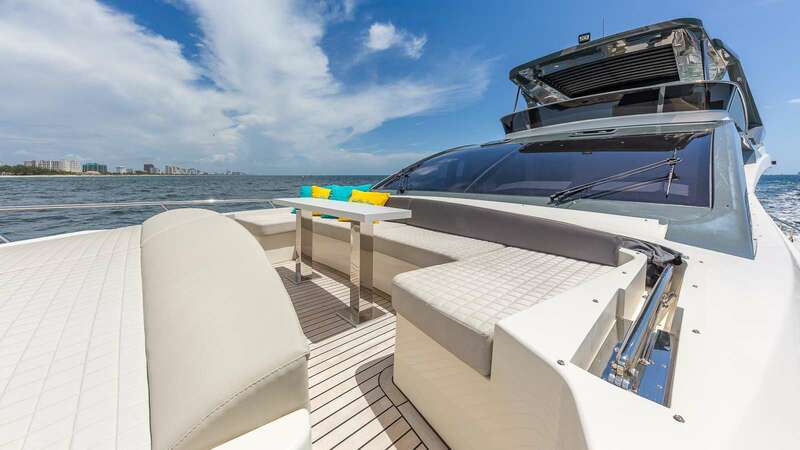 More sunbathing space can be found on the flybridge, where the aft is covered with sun loungers and a retractable bimini shade exposes the area to the sunshine. 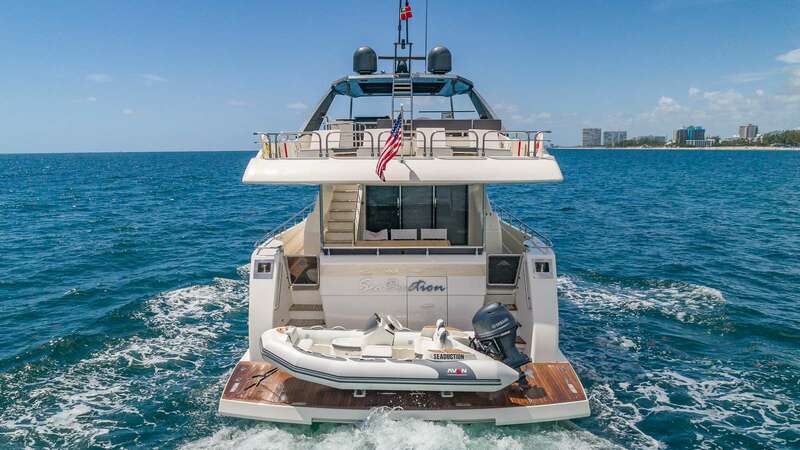 A wet bar and C-shaped sofa designed for all-day outdoor relaxation are placed amidships, and the forward flybridge is fitted with the helm controls to port and a convertible sunpad/sun lounger to starboard. 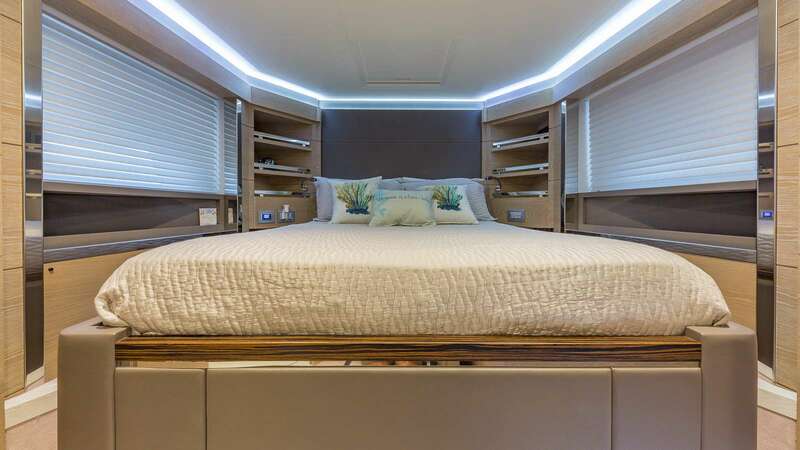 The interiors are beautifully decorated in light oak panelling and pale furnishings with accents in natural greys and browns. 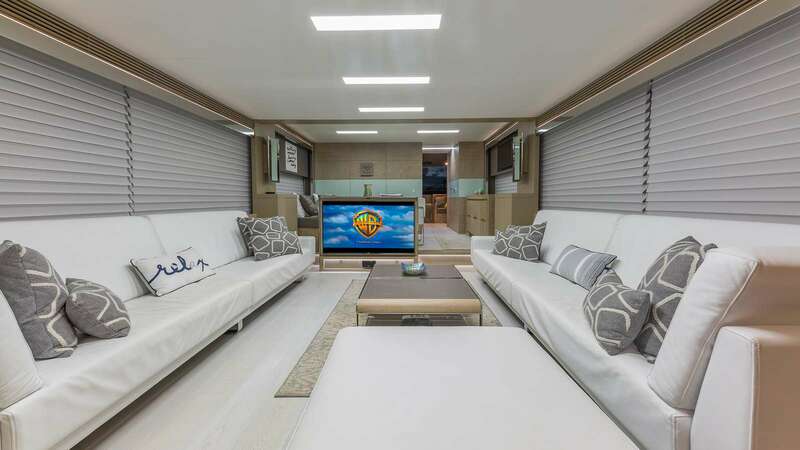 The main deck interior places the helm station forward followed by the gallery and dining area, where a square raised table is placed around a corner sofa. 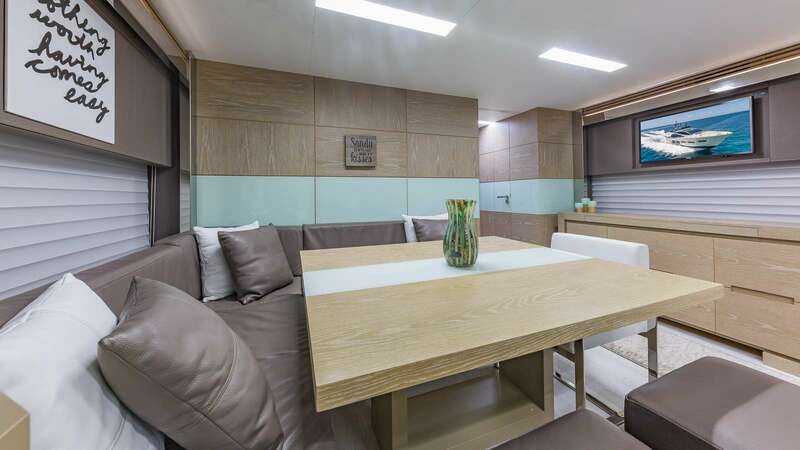 A widescreen TV on the floor acts as a divider between the dining room and lounge, which is furnished with an elongated sofa on either side with a coffee table in the centre and footrest. 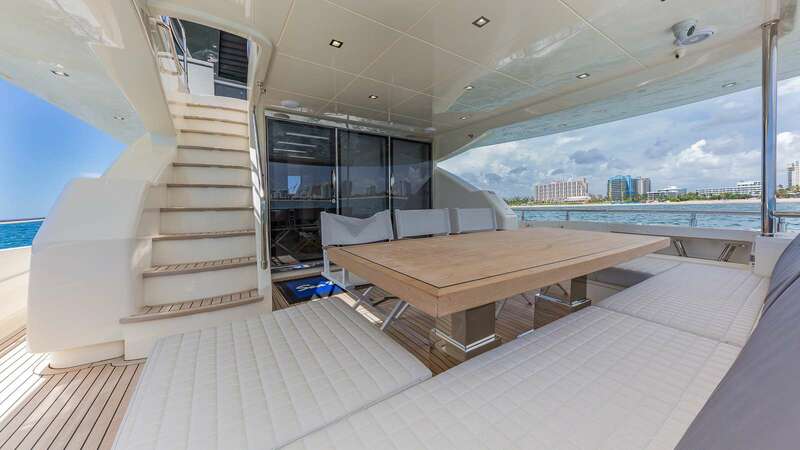 Large glass sliding doors lead out onto the main deck cockpit, and they can be opened for a greater connection to the outdoor natural ambiance. 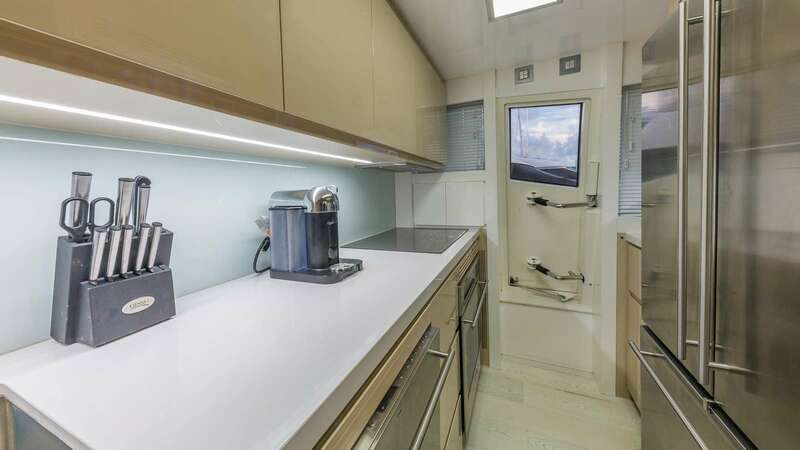 The lower deck hosts the guest and crew cabins as well as a large tender garage to the stern. 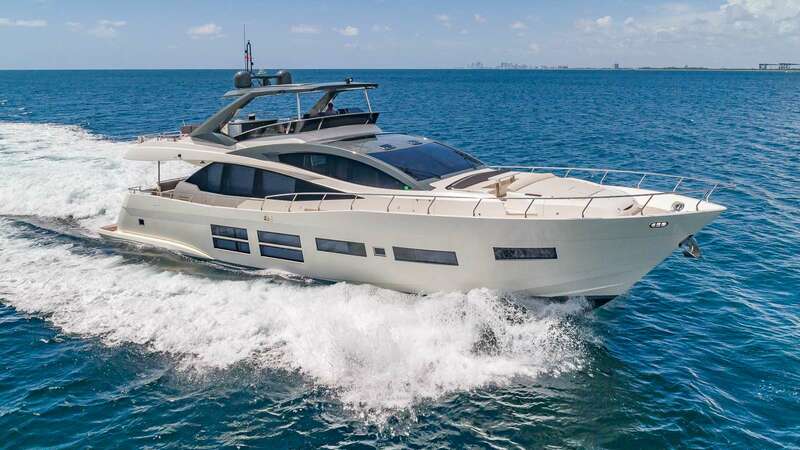 A pair of MAN V12 Kohler 23 engines producing 1,550 HP produce an exciting top speed of 32 knots and a cruising speed of 21 knots with a range of 500 nautical miles. 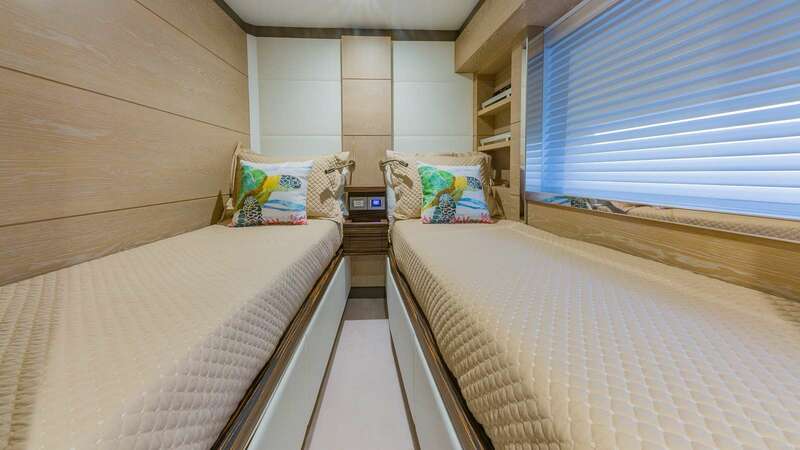 The accommodation sleeps a maximum of 8 guests over 4 en-suite cabins: 1 Master suite, 1 VIP stateroom, 1 double cabin and 1 twin cabin. 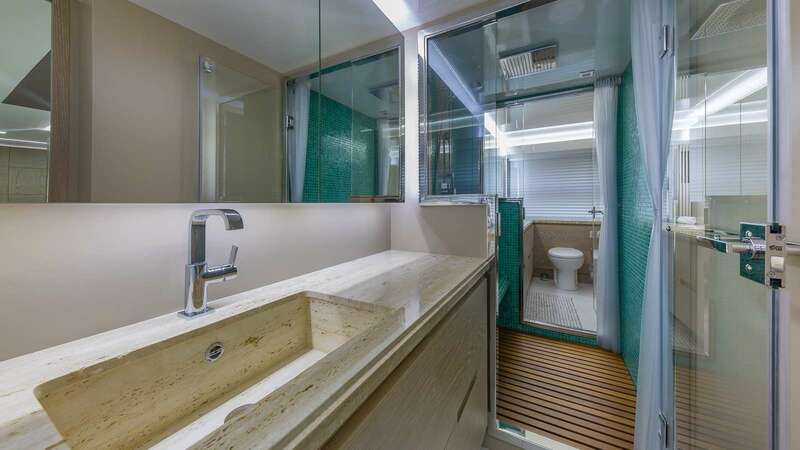 The Master suite is furnished with a king-sized bed with a widescreen TV opposite, and the adjoining en-suite bathroom with his and hers sinks and a beautifully tiled walk-through shower. 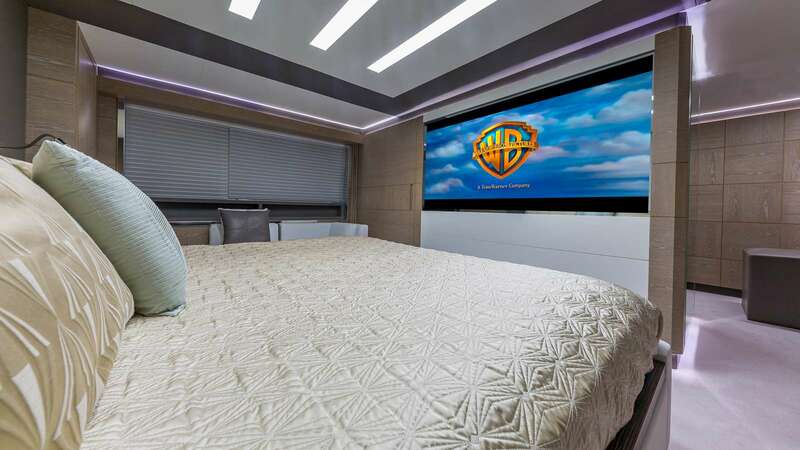 The VIP stateroom also has a widescreen TV opposite the queen-sized bed and an en-suite bathroom containing a toilet, sink and large shower.